Hello and Welcome to another edition of Real English Conversations here at Better at English dot com. This is Lori comin’ atcha from the Better at English studios here in Southern Sweden, where as you might be able to tell, I’ve got a really bad cold. But hey, your learning is more important than my voice, so I’m going ahead and podcasting for you anyway. So before we get on with the conversation, I just want to say thanks very much to everyone who’s provided feedback about the show. I try to reply to everyone who emails a comment, but Franck in France and Mustafa in Turkey, there’s no way for me to reply to you when you send a text through the Mychingo site, so I’ll take the opportunity to thank you here for your nice comments about the show. OK, without further ado, here comes another episode of Real English Conversations. Lori: …and for his birthday the people in the office had gotten together and completely papered his entire office with Post-its — it was like, some 47,000 Post-its or something posted all over his office in this multicolored rainbow. 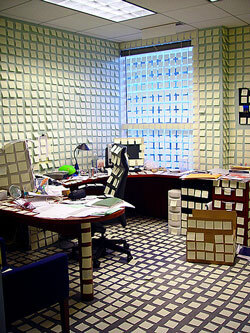 And there was this whole collection of different office pranks in this photo collection on Flickr. And I, I, you know, I don’t really have much experience working in an office, but you do, and I was wondering if you ever played office pranks at any time? M: Most of the time that I was working in an office we were too busy working to dead— unrealistic deadlines to think about pulling pranks. And usually the, the people I was working for were rather strict and didn’t have much in the way of a sense of humor. So pulling office pranks isn’t something that we were…it was never on the agenda; we wouldn’t have got away with it. M: Not really no. We were, seriously, we were too, I’m not exaggerating, it was very busy, always focused on the work, and always a very short deadline with a lot of work to do. So there were very few idle moments when you would be able to pull off a prank. L: Oh…well, that’s too bad ’cause I think a little bit of fun in the workplace probably makes people happier and, and, and, and work better. M: I would agree, that’s something that would’ve made things more enjoyable, perhaps. L: I mean, you don’t want people goofing off all the time on company time but I think, you know, a few, a half an hour here and there with people having some fun, that in the long run you’d have more productive and happy employees. M: Sure, yeah, I think that’s a fair comment. Thanks for tuning in to this edition of Real English Conversations. As always, you can find the full transcript of this podcast at our website, Better at English dot com. And from now on, there is also a PDF file of the transcript available for download at the website. Thanks to Arpad S for suggesting this feature. So keep your questions and comments coming in — it totally makes my day to get feedback from listeners out there. And if you’re subscribed on iTunes, why not log in and leave a review now? That would be awesome! Good luck with your learning, and we’ll see you next time. Bye for now! if A is to do with B, then A is connected to B. You can use the word “apparently” to show that you have some doubt about what you have heard or read. A Post-it is the brand name of small note papers with a sticky strip on the back that allows you to stick it to objects. Like the image in the transcript above. a deadline is the date that a project or piece of work is due.